Welcome to Will's Skull Page ! This website was originally based on my collection of skulls, in an attempt to communicate my enthusiasm for this odd hobby. The result has been gratifying, with hits now over 3 million, many from the US where they still teach real zoology. The site has gradually expanded to include skulls photographed elsewhere and to cover topics such as identification and preparation, although the site retains a vaguely UK-centric focus. 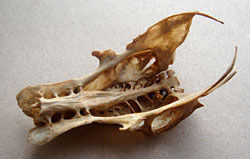 I like to see photos of skulls you may have found, and will do my best to identify them. Please look at the advice on my contact page on how to submit pictures. Only research paper writing service can help you achieve good results. Found one of these ?